Keratin is the major component of hair (and nails). It’s a protein that makes up the outer layer of your skin, your hair, fingernails, and toenails. Actually, keratin is everywhere in the animal world: the hooves, claws, and horns of most mammals, the scales of reptiles, the shells of turtles, and the feathers, beaks, and claws of birds. Many copies of this protein molecule assemble into a large helical structure that provides the structure and rigidity to the material. Keratin proteins contain lots of sulfur atoms in the form of cysteine amino acid residues. These sulfur atoms can form linkages between keratin strands and between the larger helices that are formed, leading ultimately to a curling of the hair strand. Yep—you guessed it: The more disulfide bonds there are, the curlier your hair will be. Hair straighteners work by breaking these disulfide bonds, relaxing the hair to a straight conformation. 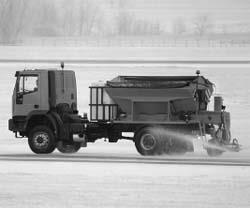 We spread salt on icy roads to melt the ice, which works because the salt lowers the freezing point of frozen water.